In February 2010, the university launched an ambitious planning initiative with the visionary goal to be recognized as a Top 50 Public Research University by 2025. Building on our collective history as a public land-grant institution, we embarked on a planning process that was inclusive and exciting. With broad involvement, K-Staters worked together to craft our future. The dialogue throughout this planning effort was as important as the final plan itself. This university strategic plan is the culmination of an 18-month process that involved more than 500 students, faculty, staff, alumni, and friends. Opportunities for others to contribute came during three formal comment periods. Eight key university metrics have been identified to benchmark and measure our progress to becoming a Top 50 Public Research University. Seven theme areas with goals, associated action plans, and expected outcomes were defined, as well as eight common elements spanning all theme areas. We want to thank the many members of our K-State family for the time, enthusiasm, honesty, and passion exhibited throughout this effort. We are well on our way to advancing the 2025 vision. 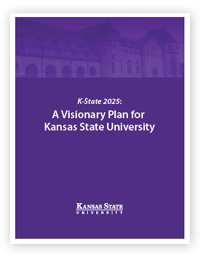 This strategic plan and the vision define us as a great place for undergraduate students and a modern land-grant university valuing and integrating research, education, and engagement. 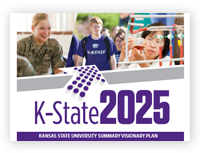 As a living plan, K-State 2025 serves as a guide for our decision-making and priority setting. Achieving our goals will not be easy — many of the initiatives will take several years to accomplish and may raise additional strategic questions and challenges along the way. Moving forward requires new ideas, new plans, new resources, and new ways of doing things. In the next step, planning will expand from the university-level focus to the colleges, departmental, and similar units. We invite your continued participation to help bring this vision to life.